We are excited to be working with SJM to bring four of the most iconic names in hip-hop together to the UK for the first time ever, celebrating incredible landmarks in their respective careers. Coming to a city and a store near you: Wu-Tang Clan, Public Enemy, De La Soul and DJ Premier, a.k.a. ‘The Gods of Rap’ – a genuine bucket list event for any discerning music fan. The tour will take place at the SSE Arena Wembley in London on 10th May, Manchester Arena on 11th May and in Glasgow’s The SSE Hydro on 12th May. 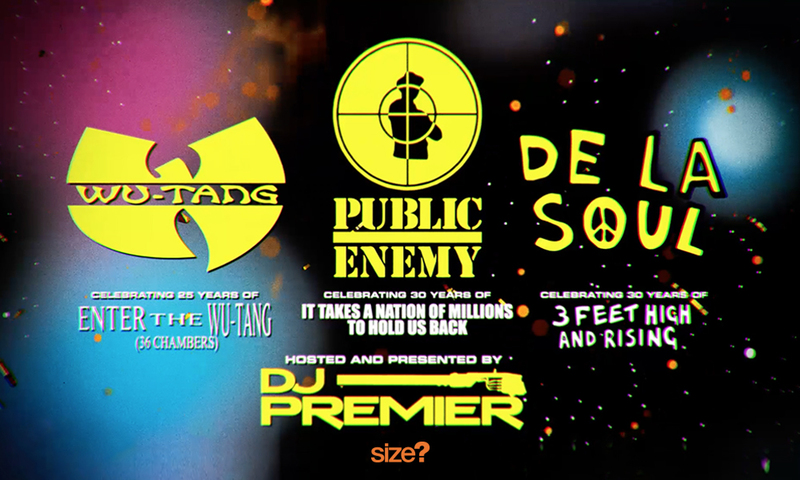 This once in a lifetime tour marks the anniversary of three iconic landmark albums: Wu-Tang Clan’s ‘Enter The Wu-Tang 36 Chambers’, Public Enemy’s It Takes a Nation of Millions to Hold Us Back and De La Soul’s 3 Feet High and Rising. The dates will also be hosted and presented by the legendary DJ Premier.